We are a hometown graphic design firm in Clinton, OH. With over 19 years of design experience, 6th Avenue Concepts can help you with your next print design project. We offer a wide range of services at competitive prices. Let us help you turn your clear thoughts into visual reality. Worked closely with in-house sales reps, clients and outside agencies. Responsible for advertising design. Color correct photos; send newspages to off-site print facility. Lead designer for a monthly 230+ real estate magazine. Helped implement and streamline production procedures. Responsible for advertising design, cover design and special project design. Color correct photos and send PDF marriages to off-site print facility. 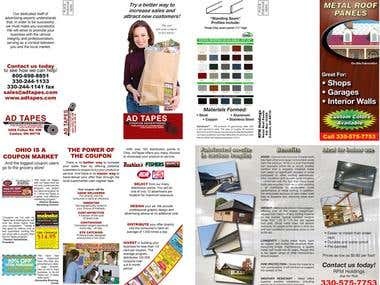 Led a staff of three designers in producing daily advertising and newspaper layout. Supervised the creation of retail advertising; coordinated production schedules of advertising and custom publishing projects. Worked with in-house sales reps, clients, and outside agencies. Examined output negatives for quality control; section cover design.